EN: We help our clients connect product development, market communication and sales through digital technology and development of team abilities. Above all, we apply game-design logic and create gamified, playful experience for respective stakeholders. SI: Naročnikom pomagamo povezati procese razvoja produktov, produktno tržno komuniciranje in prodajo, in sicer s pomočjo digitalne technologije in razvoja kompetenc timov. Pri tem uporabljamo logiko iger in ustvarjamo igrificirano, igrivo izkušnjo vseh vpletenih deležnikov. Engaging users to create content in a playful way, get to know the new products and learn about the brands. Users invite their friends to join the fun, fans statistics rise. Marketing and gamification are an obvious match made in heaven. >> See case studies: Vse=mogoce and Tripotnik. Creating tools to helps sales people find the best routines and meet the client's objections and difficult questions. When these tools come as games, training is effortless, fun and effective. We specialize in gamified tools, such as custom playing cards (designed according to sales scripture), The Big idea cards and custom-made quizes (designed according to sales scripture). For the most break-through moment, we use live-action role-playing games (LARPs), designed especially for the sales force. Game-based learning and training is the most hands-on proof of the power of games as educational tools. We provide fully gamified assessment centers and development centers, using LARP, serious games and gamified simulation trainings. This union is perhaps the most fruitful one, with new products created almost weekly. Our best cases connect 3 or more corners of the service model. 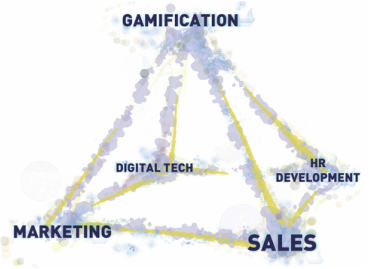 The campaign Vse=mogoče (Everything=possible) successfully connected gamified marketing, technology, sales and sales force training. We hope to create more such success stories. The most obvious match of all - yet we don't create stand-alone digital games. We use digital technology to support business processes like marketing, sales and HR development.